PREFERENCES: Visa found Europeans favour fingerprint recognition. Click to enlarge. More than two thirds (68%) of European consumers want to use biometrics as a method of payment authentication, research from Visa reveals, and 73% see two-factor authentication — where a biometric is used in conjunction with a payment device — as a secure way to confirm an account holder’s identity. 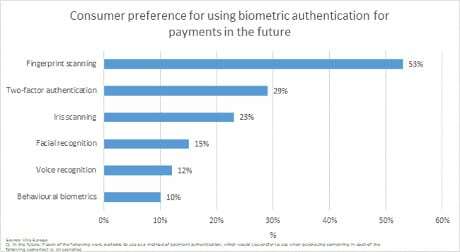 When looking at the benefits of biometric authentication, 51% state that biometric authentication for payments could create a faster and easier payment experience than traditional methods. Similarly, a third (33%) like the fact that biometric authentication means that their details would be safe even if their device was lost or stolen. In the study of more than 14,000 Europeans, fingerprint recognition tops the list of the most favourable form of biometric payment with 53%, followed by two-factor authentication (29%), iris scanning (23%), facial recognition (15%), voice recognition (12%) and behavioural biometrics with 10%. When looking solely at the perceived security of biometric technologies, 81% see fingerprints as most secure, followed by iris scanning (76%). Only 12% of consumers say they would prefer voice or facial recognition as a payment method in-store, while 15% say they would prefer voice or facial recognition as a payment method online. 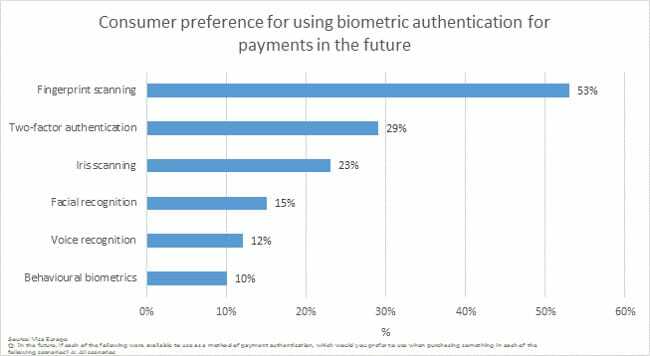 In the UK, these figures fall to 8% and 12% respectively for voice and facial recognition as payment forms. The findings also reveal that 48% of Europeans want to use biometric authentication for payments when on public transport. 47% want to do so when paying at a bar or restaurant, 46% want to do so to purchase goods and services on the high street, 40% want to use it when shopping online and 39% want to do so when downloading content. “It could result in a false positive or false negative because, unlike a PIN which is entered either correctly or incorrectly, biometrics are not a binary measurement but are based on the probability of a match,” Vaux continues. “Biometrics work best when linked to other factors, such as the device, geolocation technologies or which an additional authentication method. “While biometric forms of authentication offer significant opportunities to achieve the right balance between convenience and security, they are not the only answer,” Vaux adds. “In the future, we will see a mix of solutions dependent on the purchasing situation. Mobiles are making biometrics practical. Biometrics make security convenient. Fingerprint is an improvement over the PIN in such implementations as Apple Pay. I expect to see users given the choice of speech, image, or eyes as alternatives to fingerprints. Most phones have user facing cameras and microphones while not as many have fingerprint readers.